Montréal was one of my favourite cities. Moving there because I fell in love with a musician was an extraordinary adventure and for months I reveled in every moment. People were engaging and hilarious and artistic and political and just so cool. I met two cousins I didn’t even know existed and finally felt like the whole side of my family I’d lost before I was born might still have meaning for me. I went on tour with my partner and when we came home at midnight we dragged our suitcases up the stairs of a three-story rowhouse, holding on to the wrought iron railings and ordering pizza or poutine because we were too excited to sleep. Our ceilings were high and we had pillars in the bedroom. We spent mornings drinking coffee on the balcony, looking over St-Denis and lazily planning the day (croissants, Jean-Talon market, a show). I’d never been so happy, so free, so far away from the life I’d created in my hometown and then abruptly discarded in 2012. And then suddenly I was sick and we didn’t know why. 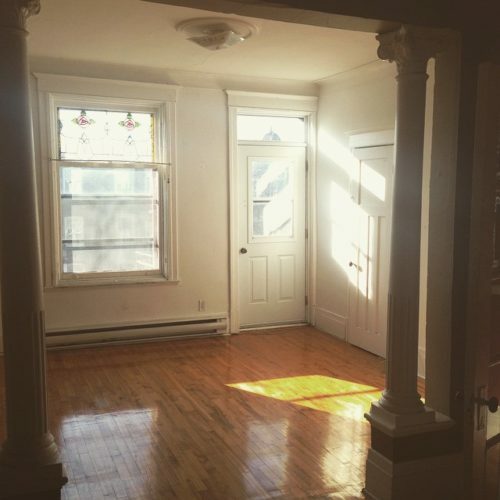 I couldn’t go up or down those quintessential Montréal rowhouse stairs anymore – no market for me, no shows, no work. If I did manage to make it down, I couldn’t get to the metro – even on the rare days the first escalator worked, the second level down was only accessible by stairs. If I did make it down further, the dampness of being underground on an island in the middle of a seaway overwhelmed me. Every day I sunk further into immobility and pain. I didn’t see many of my cool new friends anymore, and I hadn’t yet learned to ask for the kind of help that is primarily emotional, the kind of help that comes when your friends just come and sit with you. I didn’t know what was wrong with me and my new doctor prescribed stronger and stronger painkillers that came with such intense warnings from the Pharmaprix pharmacist that I was too afraid to take them. The end of my research grant was looming and Montréal felt like a closed door – or a door slammed in my face: not just the physical environment (the dampness, the extremes of temperature) but the social one too. If I’d had the energy to be afraid that I was dying I would’ve been terrified – as it was, my partner was terrified too, and we didn’t know how to tell people. When we did tell people I’m not sure they heard us, or knew what to say. By the time we left I was spending 23 hours of most days in various prone positions (bed, couch, bathtub – from one to the next again and again). My partner was doing everything – making all the money, preparing all the food, getting all the groceries. They didn’t want to leave for tour, because how would I survive with them gone? But my partner is a musician – how would we live if they didn’t tour? Every option felt like death. I sometimes thought if I could just rest enough I could run away and let them live without me, but not only is that a decision that was theirs to make and not mine, I didn’t have the energy to leave anyway. No amount of rest was ever enough. The Latin words requiem, requiescat and requies all have in common the idea of resting or reposing (quiēs). Yesterday I read Maranda Elizabeth’s post on the joy of missing out over at The Establishment and was linked to Johanna Hedva’s Sick Woman Theory, which I usually have open on my phone’s browser so I can read it on the way to class. I was reminded that I am not alone, and that so many of us are resting right this very moment. I think about the idea of rest a lot. Not all rest is temporary. Not all rest brings you relief. For me there is no longer any relationship between X and Y – or if there is, it’s inconsistent and unpredictable. I can rest for X hours and still not have the energy or ability to get out of bed. I can spend most of a night sleepless and (sometimes) (rarely) still make it to the next day’s class. I cannot control this and I cannot count on it and I cannot make a pattern out of it and so often the idea of rest just sends me into rage and sorrow. Whenever I begin to write about a topic that brings me a great deal of joy, I somehow always end up back in trauma and grief. I find this extremely boring on my part and yet I don’t quite know how to be any other way. This post was supposed to be about knitting and nature documentaries and finding some meaning in myself as a body at rest. But resting with no end and no relief is sometimes for me just another kind of death, and so sometimes my illness is a death for me too. The self I was before is dead now and now I’m someone else. I’ve done this before, this snakeskin shedding of self, and there’s a familiarity to it that is both disturbing and comforting, but enraging too. Most doctors believe the illness I have been diagnosed with is exacerbated by rest, so they will encourage their patients to rest less. The medical system I was raised in and to which I have access doesn’t handle chronic illness or trauma or even physicality very well, so I’m not sure I agree that resting is inherently bad for me. I just don’t see it as good for me either, since I can’t depend on it to give me anything I need (like a decrease in pain or an increase in cognitive function). Rest is instead a category of existence imposed on me. Rest is not something I choose. Rest chooses me and sometimes I welcome it and sometimes I don’t. When we first moved here in September 2015, I was very tired. Six months before we had moved to Calgary with two goals in mind: understanding what was happening to my body and giving me a chance to make some money (namely through starting a PhD, since academia was the most lucrative option open to me at the time). In June of that year I had started some new medication, which eventually allowed me to get out of bed most days and even start reading again. Unfortunately, being in back in my hometown, combined with some family events from that summer, turned me into the saddest version of myself I’d been since my teenage years. So I turned down the scholarship that would have allowed me to at least pay my rent for three years and we packed up our belongings and headed to the coast, just in time for me to write the LSAT and apply to law school. After I drove us here and unpacked and wrote the LSAT, I – unsurprisingly – crashed hard. Sometimes I think of my flares like tidal bores. I know about tidal bores from watching nature documentaries. If my illness is an ocean, sometimes my body is a set of circumstances and locations giving rise to a steady increase in the level of water (that is, pain) until it reaches my high-water mark and I know I need to rest until the water goes back down. If I use the metaphor of tidal bores to mean flares, I could use the metaphor of a tsunami to mean something else. But while my flares send me into periods of rest, the tsunami version of pain is something completely different. I’m not ready to write about that yet. Here’s the moment when we realized we had to leave Calgary. It wasn’t when we first said it out loud (July 2015, driving down a highway in a car2go). It wasn’t when we first told people we might have to leave, or when we said we were leaving, or even when I emailed my university apologetically and turned down the largest scholarship I will ever receive, which was when the full financial weight of our situation became clear to me. We knew we had to leave Calgary in May when I got too sick with pneumonia to get my own juice from the corner store and my partner had to cancel a show in LA because they were still the only person to take care of me when I couldn’t leave the house. Because being in Calgary, in our shared hometown, made it impossible for us to admit any vulnerabilities to the people around us, even our friends. We both knew in our deepest selves that vulnerability in Calgary gets you killed and there is no amount of therapy that will take that weight of knowledge from us. Today is a resting day for me. Because of my medication and my partner, I ate breakfast and had a bath and managed to type this out, none of which would have been possible for me in Montréal at a similar level of pain and fatigue. I had planned to read some texts for law school and walk to the ocean with a friend, but I’m not sure I’ll be able to do that. My friend still plans to sit with me anyway and maybe my partner will make us tea. Maybe I’ll write a poem or knit part of a scarf. Rest for me these days is less excruciating than the rest I felt in Montréal or Calgary, and there are many reasons for that. Still, the truth is that I am resentful of the rest I need. I still resent my own self for needing it, for forcing me to cancel my plans and spend the day watching nature documentaries over and over because they’re the only entertainment that isn’t too overwhelming. Someday maybe I’ll write that post about knitting and David Attenborough and finding meaning in the material, physical world in which I am a body. I’m looking forward to that day, to the self I’ll be when I’m both resting and restful.